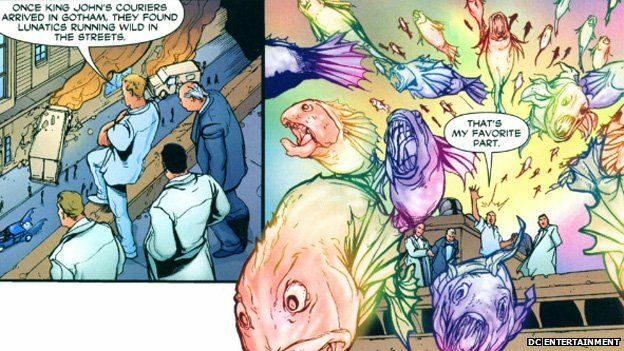 Gotham is a fictional city in the DC Universe but its namesake is not. 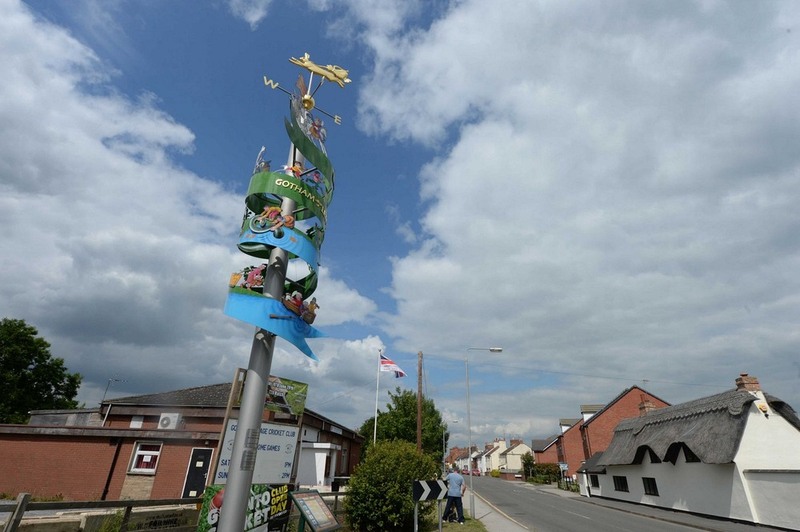 Located across the Atlantic in South Nottinghamshire, this quiet, little village with a handful of houses, a church and a couple of shops, is completely unlike the city of crime and corruption it lends its name to. For starters, Gotham is actually pronounced “goat-um” (which means goat village) and not “goth-em”, the way we pronounce the fictional city Batman calls home. 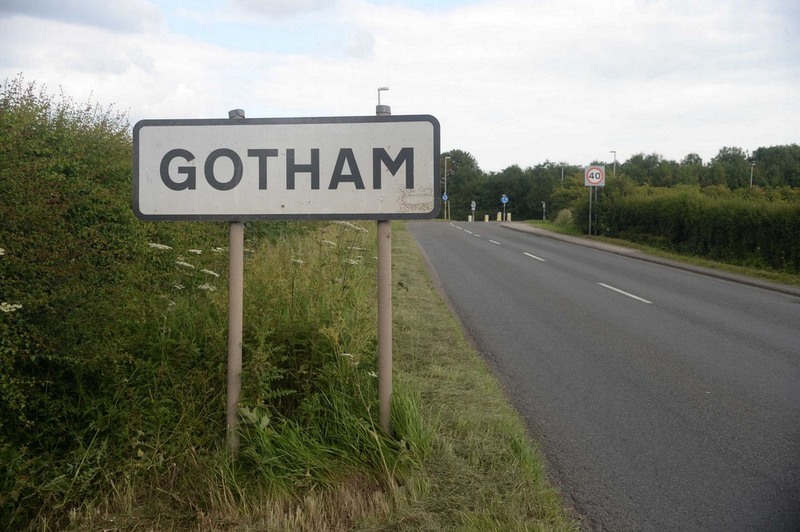 While Batman’s Gotham is a teeming metropolis, the English village is a sleepy settlement “in the rural heart of Nottinghamshire.” Yet both share a connection rooted to a legend that started eight hundred years ago. The story goes that in the early 13th century, King John of England, who was much despised by his subjects, was supposed to pass through Gotham on his way to Nottingham Castle. In those times, wherever the royal carriage rode the path would became a public highway and thus the King’s land. 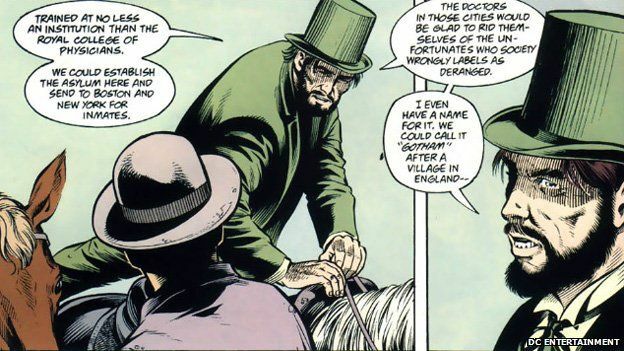 This meant that certain landowners of Gotham were going to inevitably lose their land, and it upset them. Rumor also spread that the King was not merely passing through, but wished to build a hunting lodge at Gotham, or perhaps even a castle. So the wise men of Gotham gathered one evening and hatched a plan to keep the King and his men away. They feigned madness. Madness was thought to be infectious that could spread from person to person just like chicken pox or common cold did. A 2014 paper by Jessecae Marsh and Lindzi Shanks, published in the journal Memory & Cognition, found that some people still believe that mental illness could spread from an affected individual to a healthy person. When King John's knights arrived to inspect how the villagers were preparing to receive the King, he saw the villagers engaging in a variety of absurd tasks, such as attempting to drown an eel, and building a fence around a bush to prevent a cuckoo from escaping. The trick worked, and the knights made a hasty withdrawal fearing they would catch the villager’s madness. The King never set foot on the village. 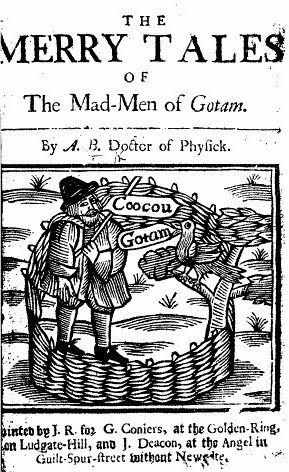 Stories about these bizarre antics and how the wise men of Gotham fooled the King was passed down from generation to generation until they appeared in the written format for the first time in 1565 in a book entitled Merrie Tales of the Mad Men of Gotham. Three centuries later, in 1807, American writer Washington Irving launched a satirical periodical called the Salmagundi papers, where he frequently lampooned New York City’s culture and politics. He repeatedly called New York City “Gotham” based on the mediaeval stories of alleged stupidity of the people of Gotham, Nottinghamshire. 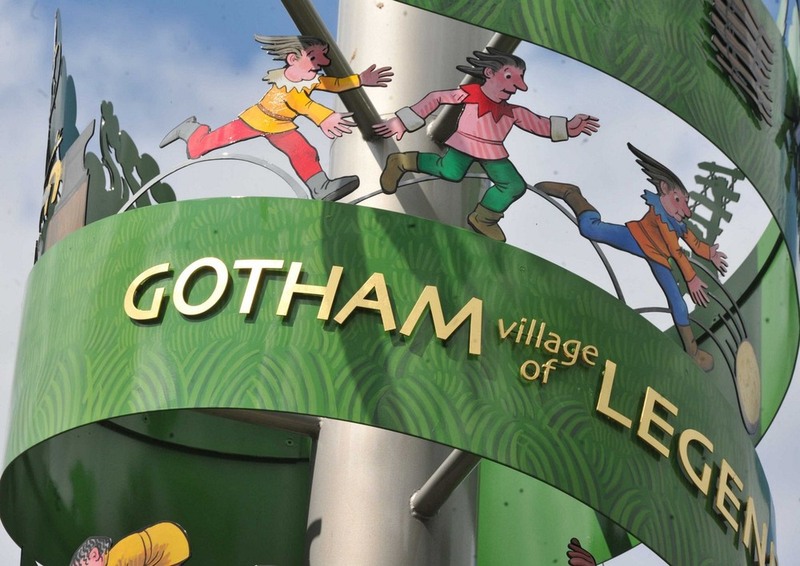 Somehow, the name stuck and Gotham became a popular nickname for New York City and is still used today in shop names and establishments such as the Gotham Center for New York City History. It was one such name—Gotham Jewelers—from which Bob Kane and Bill Finger found inspiration when they created the caped crusader in the late 1930s. 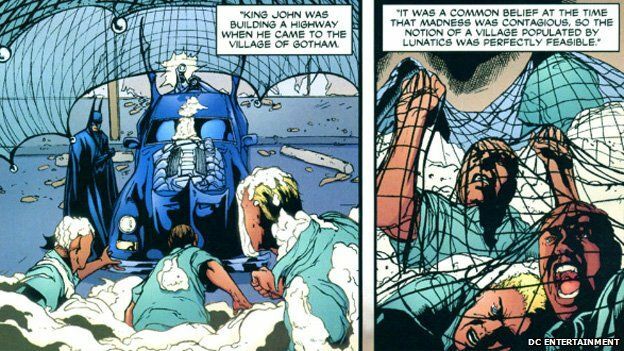 The link between the two places was acknowledged only in 1996, in a story called “Cityscape”, written by Dennis O'Neill in The Batman Chronicles #6. 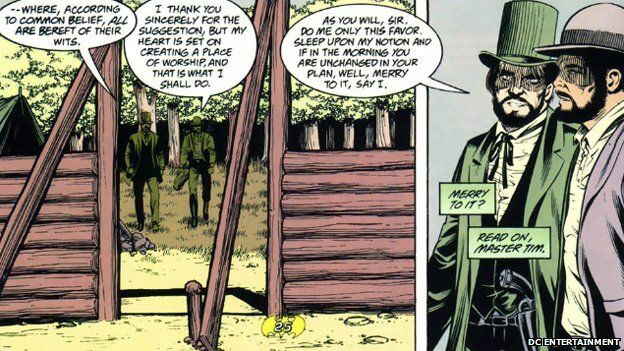 In this story, a villain decides to build an asylum in a forest to house the criminally insane, and proposes to name it Gotham “after a village in England where, according to common belief, all are bereft of their wits”. For years, the chairman of Gotham Parish Council tried to have her village twinned with New York City. She wasn’t successful, but New York’s mayor Rudolph Giuliani did send her an assuring letter wishing Gotham well and acknowledging the cultural and historical link between the two places. 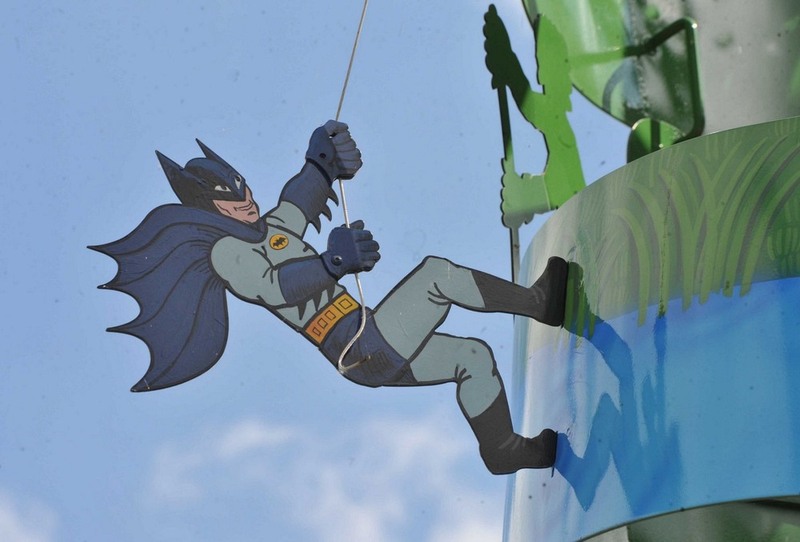 The legend of Gotham and its connection with Batman is depicted in a sculpture unveiled a few years ago in the center of Gotham. It’s a wind vane with a decorative ribbon encircling the pole telling the story of King John’s visit. A tiny figure of a Batman can be seen climbing on the side.